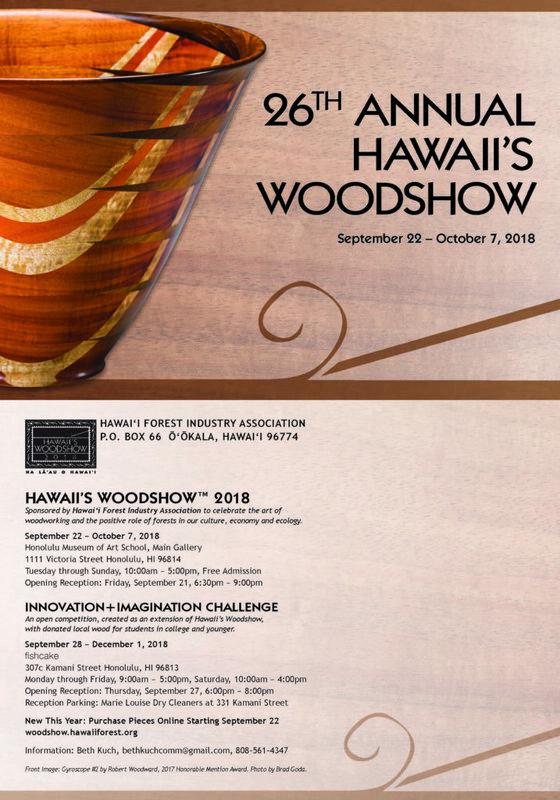 Hawaii’s WoodshowTM, Na La‘au o Hawai‘i is Hawai‘i Forest Industry Association’s (HFIA) annual juried woodworking exhibition. The 2018 Hawaii’s Woodshow will be held September 22 through October 7, 2018 at the beautiful Honolulu Museum of Art School Gallery. Hours are Tuesday through Sunday from 10 am to 5 pm and admission is free. Attendees to Hawaii’s WoodshowTM are treated to extraordinary heirloom-quality works made from Koa, Mango, Kamani, Milo, Norfolk pine, macadamia nut, Kiawe and other interesting and beautiful Hawai‘i-grown woods. Hawaii’s Woodshow encourages an appreciation for the participating artists and the materials they use. It promotes the positive role forests play in our economy and ecology. The Show calls for the use of wood from Hawaiian-grown tree species, especially those that have been planted and brought to maturity here in Hawai‘i. It serves as a reference point for the planting of native and non-native high value hardwoods for future generations.Three Jurors are selected from a broad range of expertise. Typically one juror is a nationally renowned artist from the abroad. Judging is based on “Inspiration of Design” and “Excellence of Implementation.” In the initial round of judging, each judge selects multiple entries from each category creating a pool of entries from each category, from which the First Place and Honorable Mention Awards are selected. Awards typically include: Best of Show, as many as five First Place awards in various categories, Honorable Mentions, Spirit of the Show, Kent Award, Artist’s Choice Award, and People’s Choice Award. 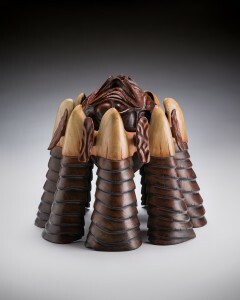 The Hawaii’s Woodshow Masters category will award premier pieces submitted by one of several invited artists. The invited artists have accumulated many awards throughout the Woodshow history and are no longer competing for awards in the main category. 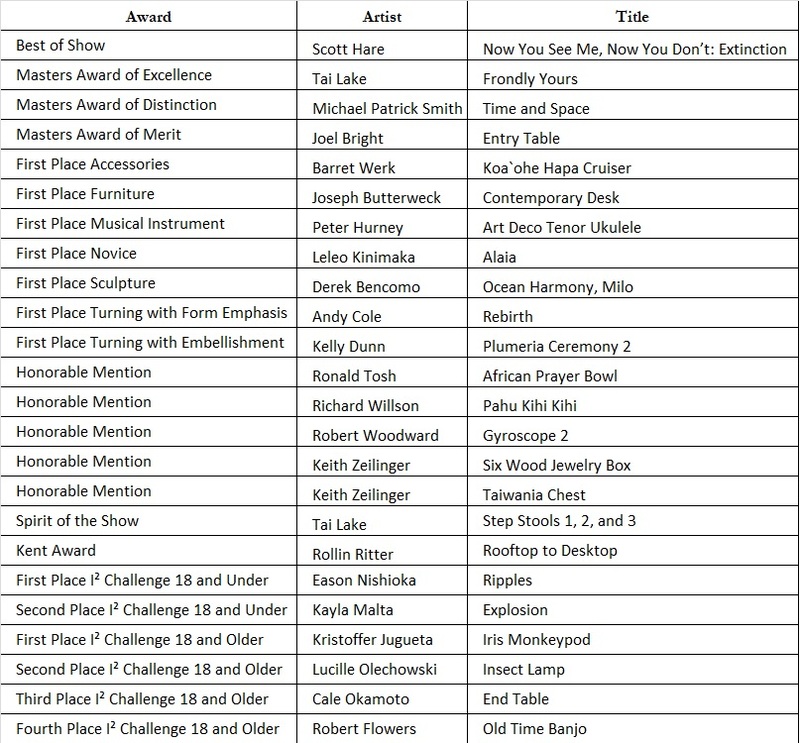 First Place Award categories are typically Furniture, Sculpture, Musical Instrument, Turning, Accessories, and Novice. Honorable Mentions are conferred at the discretion of the Judges. The Spirit of the Show Award recognizes the best use of wood from under-utilized Hawaii-grown, non-native trees while meeting exhibition criteria. Work featuring koa, mango, Cook or Norfolk Pine are not eligible Winners of this award receive premiums underwritten by C. Barton Potter. The People’s Choice Award is based on a tally of the votes by the viewing public and the Artist’s Choice Award is a tally of votes by the participating artisans. Irving Jenkins, Author and Artist – Hawai‘i-born scholar, writer and artist, Irving is celebrated for his award-winning books and artwork that reflect Hawaiian culture. Irving’s artwork references Hawaiian feather capes and niho palaoa adding patterns based on traditional calabash wood repairs and stylized letters evocative of Hawaiian designs and symbols. His work is in the permanent collection of the Honolulu Museum of Art, Hawaii State Art Museum, and Hawaii State Foundation on Culture and the Arts (HSFCA). 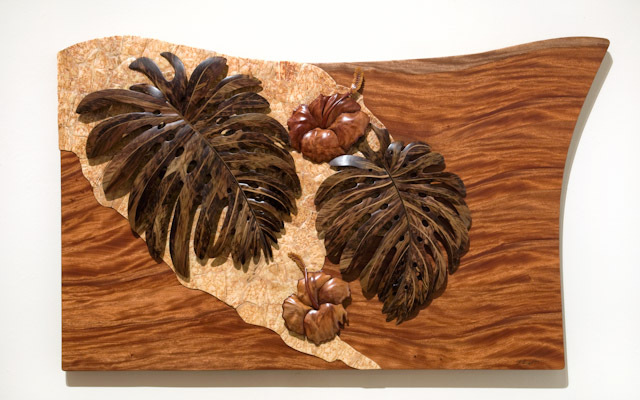 Irving was a juror for the first Hawaii’s Woodshow in 1993, and he brings his knowledge of traditional Hawai‘i wood working and of Hawai‘i history to this year’s exhibition. Sean K.L. Browne, Sculptor – Sean draws on his Hawaiian heritage to reference cultural and historical symbols in his work. Best known for monumental site-specific sculptures, he also creates smaller works for indoor display and figurative work honoring important Hawaiians such as the recent image of Pauahi at the Royal Hawaiian Shopping Center. He has taught at Kapiolani Community College, received an HSFCA Individual Artist Fellowship and many public commissions, participated in HSFCA Acquisition Award Selection Committee as a Visual Arts Consultant, and has work in museum and private collections. Sean brings his ability to place contemporary artwork within both Hawai‘i and international traditions as well as his innate sense of Hawaiian place to this year’s exhibition. 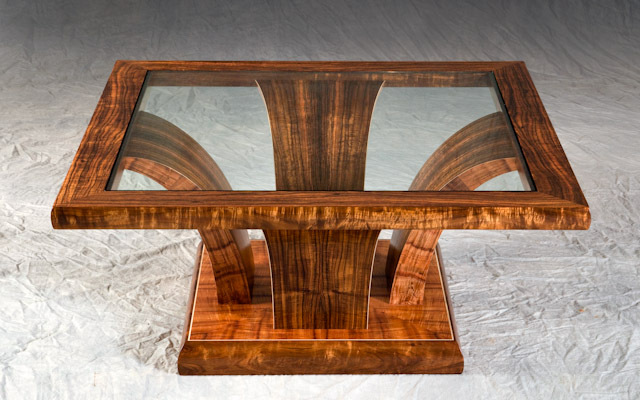 Alan Wilkinson, Wilkinson Koa Furniture – Alan moved to Hawai‘i in 1962 to surf, work and continue his education, majoring in Asian Art History and Sculpture at the University of Hawai‘i at Mānoa. 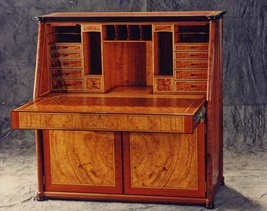 In1968, he opened Wilkinson Koa Furniture to design and build custom furniture. Among the collections that hold his work are the Honolulu Museum of Art, the Permanent Collection of the Royal Family of England, and numerous private collections in Hawai‘i and on the US Mainland. 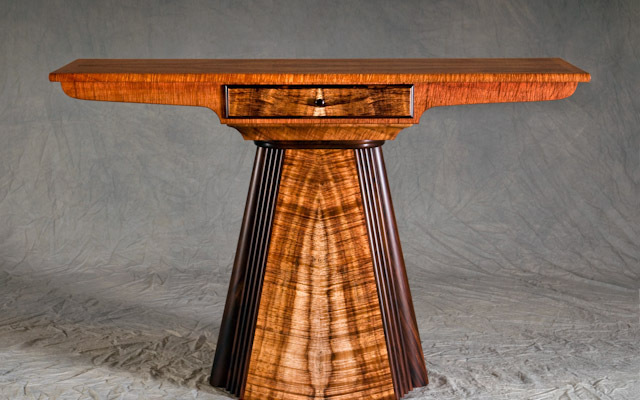 Although Wilkinson’s main focus has been commissioned pieces, he has shown his work in every Hawaii’s Woodshow™ since 1993 and is a Hawaii’s Woodshow™ Career Recognition/Master Artist. He has been a full-time custom furniture designer for 50 years. 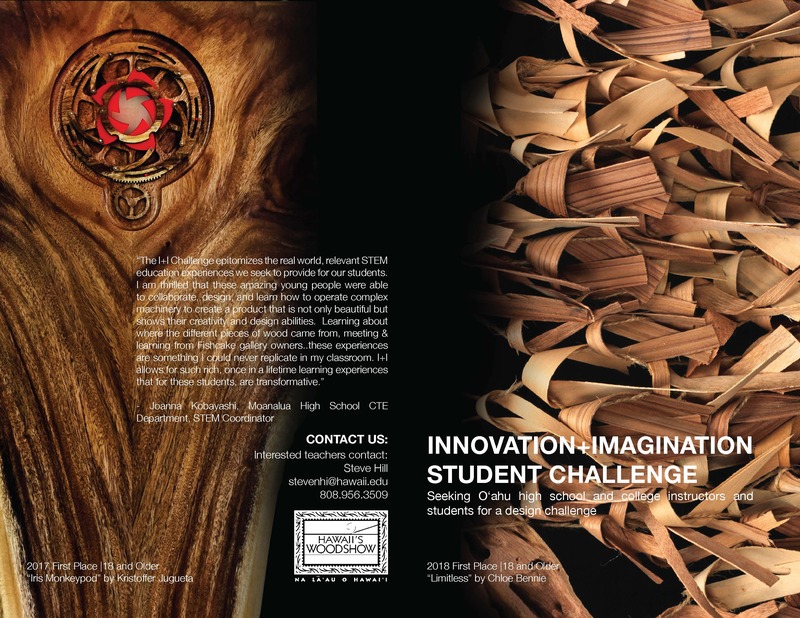 An exciting new component of Hawaii’s Woodshow is the Innovation + Imagination (I+I) Student Challenge, a division that was initiated last year to introduce students to the diverse world of Hawai‘i woods. Students are challenged to construct artwork using a mixture of donated Hawai‘i-grown wood and other materials of their choice. At the inaugural launch of I+I, 40 students participated from Moanalua High School and the University of Hawai‘i Mānoa Department of Art and Art History and the School of Architecture. The goal of this program is to expose students to a hands-on experience of design and production as well as familiarize them with the value of using locally sourced resources that will influence them in their future professions. We are delighted to welcome Beth Kuch to the Hawaii’s Woodshow ‘Ohana. She brings an enthusiasm for the Hawaii’s Woodshow mission and an awareness of Hawai‘i forest concerns and conservation projects. 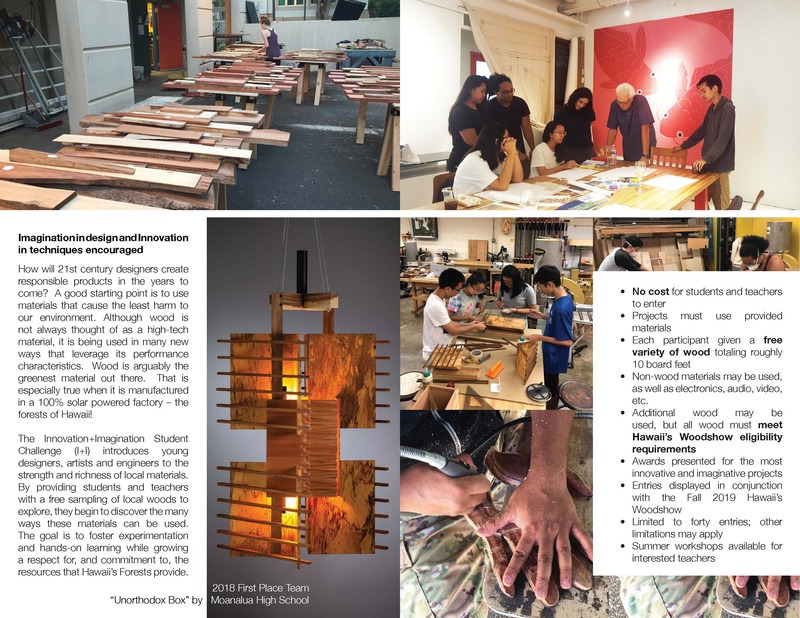 Her background in current communication trends supports Woodshow efforts to increase our audience and bring more visitors to see the world class woodwork created in Hawai‘i. Mark Sfirri runs the Fine Woodworking Program at Bucks County Community College in Newtown, Pennsylvania. 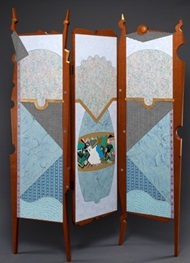 While he was trained in furniture design and production at Rhode Island School of Design, his current work is sculptural. His interest in creative aspects of wood turning led him to pioneer the use of multi-axis spindle turning to create objects that range from sculptural figurative forms to table legs. 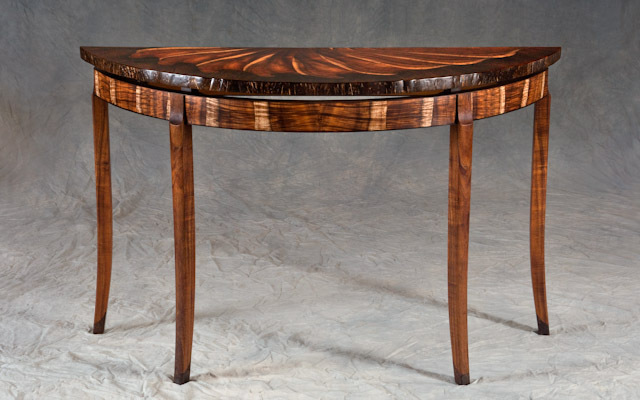 He has lectured and demonstrated throughout the United States, Canada, Ireland, France, England, and New Zealand, and has written numerous articles about furniture and wood turning. 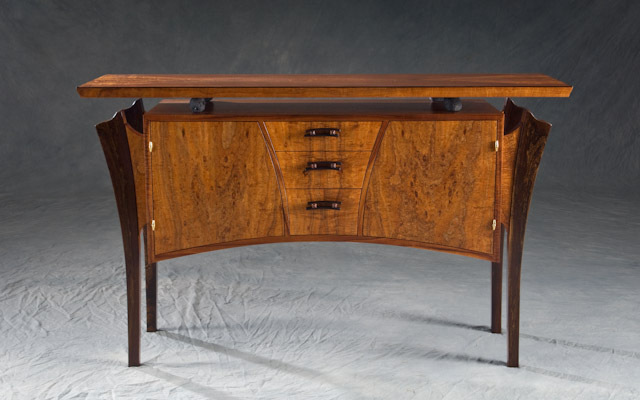 John Gonczar has been designing and building fine furniture for more than 30 years. He began building unique furniture while residing in the Waiawa Valley on O‘ahu. Interesting note, John had an entry in the first Woodshow in 1993. He now lives in the Northwest where inspiration comes in combining big leaf maple with Hawaiian woods. Noe Tanigawa grew up in Hawaii. As an apprentice to a tea ceremony potter, Baizan Nakamura, in Japan, she learned appreciation for the off kilter, and wabi sabi. American ceramics with Peter Voulkos in Berkeley instilled in Tanigawa the love for manipulating forms. Darryl Hughto, in Clement Greenberg’s collection, was her rough and tumble painting mentor in New York. In Hawai’i, she studied with Helen Gilbert and Fred Roster. Tanigawa works primarily in encaustic (wax) and gold leaf or in wax and oil on lutrador. Her paintings are in corporate and private collections in Japan and across the U.S. 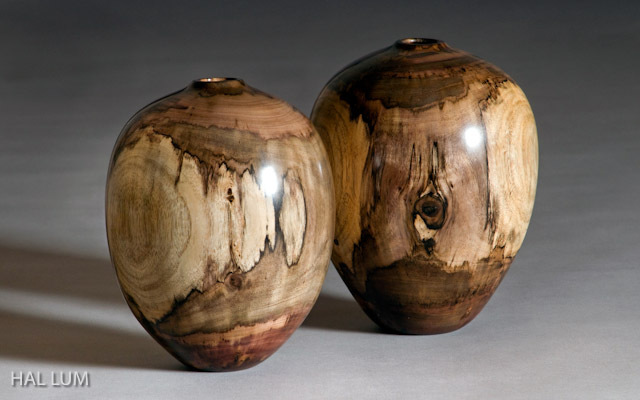 Contemporary artist, sculptor and Woodturner, Betty Scarpino is recognized as one of the masters of the genre. Her work is held in private, public and museum collections throughout the world. Betty works full time teaching, writing, sculpting and printmaking from her home in Indianapolis, Indiana. 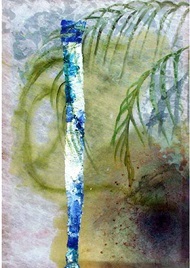 Her work is available for purchase at some of the finest galleries in America and she exhibits widely in juried shows. Betty was awarded her second Creative Renewal Fellowship by the Arts Council of Indianapolis in 2007. Learn more about Betty Scarpino here. Artist, author, and teacher, Duane Preble is a University of Hawaii Professor Emeritus. He has taught a wide variety of courses, including introduction to the visual arts, art history, photography, drawing, color and design. In 1969 he was awarded a UH Excellence in Teaching Award and in 1975 was selected for listing in Outstanding Educators of America. He has exhibited paintings, photographs and sculpture since the early sixties. After 30 years of teaching, he retired from the University to further his own art and to help the arts become a catalyst for effective public education. He is the original author of Artforms–an introduction to the visual arts, used by approximately 300 colleges and universities nation-wide now in its 11th edition. R.W. “Rollo” Scheurenbrand, Oahu Luthier began his woodworking career in the mid-70s as a carpenter. From there he moved on to cabinetry, furniture building, woodturning and eventually found what has become his passion — building stringed instruments. Working with Hawai‘i grown woods and other tonewoods, Rollo creates one of a kind instruments emphasizing tonal characteristics, playability, craftsmanship and aesthetics. He first entered Hawaii’s Woodshow in 2002. He is now in the Career Recognition category after having won awards including Artists’ Choice and Best in Show. He hand builds custom acoustic steel string guitars and ukuleles full time in his Kailua shop. Learn more here. This website produced with funds from the State of Hawaii Department of Agriculture.